Product information "HDAC Cell-Based Activity Assay Kit"
Nucleosomes, which fold chromosomal DNA, contain two molecules each of the core histones H2A, H2B, H3, and H4. Almost two turns of DNA are wrapped around this octameric core, which represses transcription. The histone amino termini extend from the core, where they can be modified post-translationally by acetylation, phosphorylation, ubiquitination, and methylation, affecting their charge and function. Acetylation of the epsilon-amino groups of specific histone lysines is catalyzed by histone acetyltransferases (HATs) and correlates with an open chromatin structure and gene activation. Histone deacetylases (HDACs) catalyze the hydrolytic removal of acetyl groups from histone lysine residues and correlates with chromatin condensation and transcriptional repression. Therefore, HDAC inhibition results in transcriptional activation through the conformational relaxation of DNA. Changes in the transcription of key genes has linked HDAC inhibitors to blocking angiogenesis and cell cycling, and promoting apoptosis and differentiation. By targeting these key components of tumor proliferation, HDAC inhibitors are currently being explored as potential anticancer agents. Cayman's HDAC Cell-Based Assay Kit provides an easy tool for studying HDAC activity modulators in whole cells. By using a cell-permeable HDAC substrate, the activity of various protein lysine-specific deacetylases including HDAC1-containing complexes can be measured in intact cells in a simple and homogenous manner. The fluorescence of the deacetylated reaction product can be analyzed using a plate reader or a fluorometer with excitation wavelengths of 340-360 nm and emission wavelengths of 440-465 nm. An HDAC inhibitor, trichostatin A, is included for checking specificity of the HDAC reaction. This assay parallels Cayman's HDAC Activity Assay Kit (Cay-10011563), which uses a nuclear extract rather than whole cells for the assay. Together, both assays will help to identify whether an inhibitor/activator has a direct effect on the enzyme. 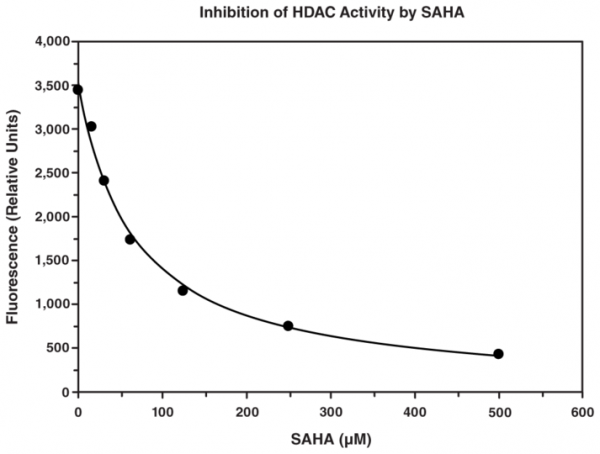 Customer review for "HDAC Cell-Based Activity Assay Kit"